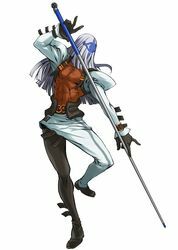 Venom first appears in Guilty Gear X.
Venom is claimed to be “openly gay,” largely because of his deep affection for Zato, his master. According to one site, his sexuality is also explicitly stated in the Guilty Gear drama CD “Knight of Knives.” However, another site questions this interpretation. Without further confirmation, we are leaving this as “rumored” for now. You can see Venom battle Bridget in this video.